A small reception to celebrate the marriage of our friends Matt and Laura got us out of the city and upstate this past weekend. They got married a couple of months back in San Diego, but the bride grew up in the Finger Lakes region of New York, and her family held a small brunch celebration for the happy couple at their home. This seemed like a wonderful opportunity not only to see our friends, but also to get out of the city and explore the rest of the state. 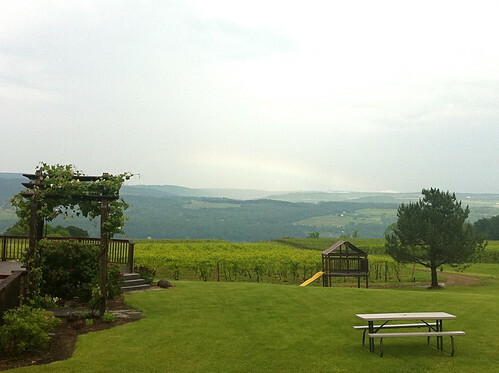 Plus, we’d heard of the Finger Lakes as a wine region, and Greg and I do love our wine. We had only one day in which to expand our palate, but we made good use of our time. 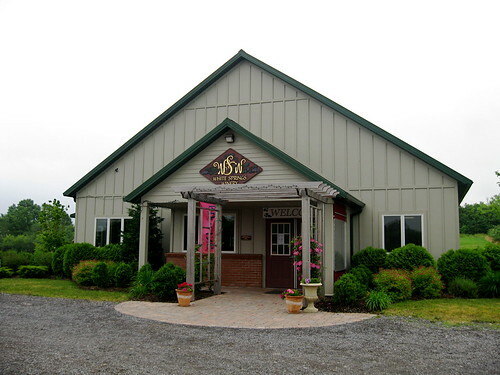 There are over 100 wineries in the area and we managed to hit seven, all along the western side of Seneca Lake. There are some great values to be found here. Now, I love my California wines, but they can be pricey. 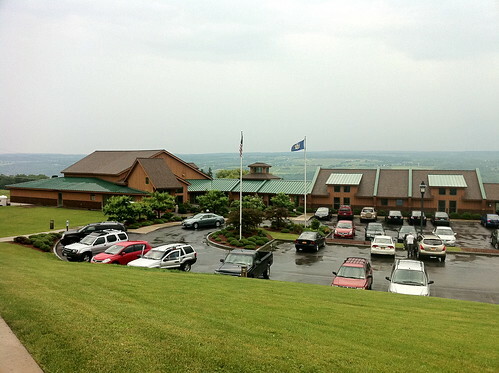 In comparison, we found the prices in the Finger Lakes to be incredibly reasonable. On top of that, the price per tasting was usually $2-$3 for a selection of 5 or 6 wines – definitely an improvement over California tasting prices which can get as high as $15. And let’s face it, as much as I like red wine, white is getting appealing as summer temperatures start to climb. We cobbled together a list of wineries to hit using recommendations from our friend’s family and from the pourers at the wineries. We’ve found it an incredibly helpful trick to ask for recommendations at wineries we like, as they usually ended up sending us to other wineries that matched our palates. 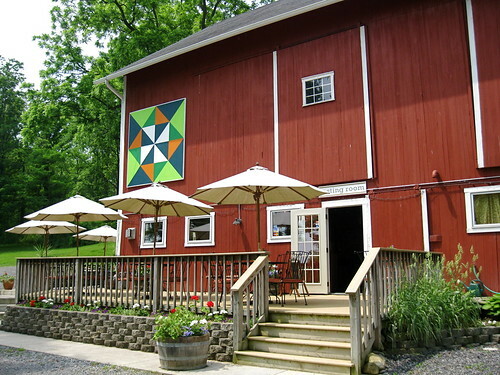 Laura recommended this boutique winery as her and Matt’s favorite. It was the first place we went and it ended up being one of our favorites as well. We found their offerings to be pretty consistently good across the board and had a difficult time making up our minds on what to take home. Despite assertions that we were going to be very moderate in our purchases, we walked away with three bottles from stop number one. We took home the 2010 Pinot Gris, which had beautiful nectarine nose and lovely peach and citrus notes. The fruity flavor hits up front, but finishes crisp. Their 2009 Syrah was one of our only red purchases of trip, which had spicy notes clove, licorice, and pepper, and just a hint of vanilla. Their house white, the 2010 Kashong White was too good a value to pass up at $10. It was easy drinking with lots of key lime flavor, a tiny bit herbal, and just a touch of sweetness. Their Rieslings were also really good, and it was particularly tough to leave behind their 2010 Dry Riesling with its crisp mineral and apple flavors. The girls pouring here were very helpful in suggesting wineries. I should also note that the same winemaker blends for another winery across the lake called Atwater. 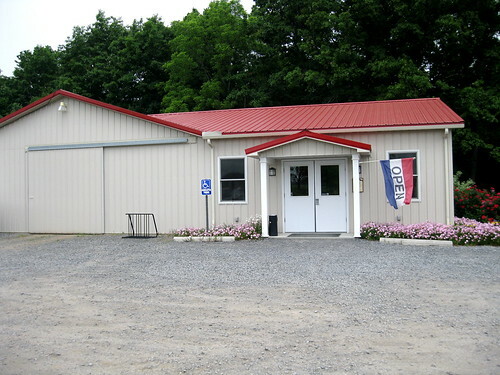 We didn’t have a chance to go there, but had a chance to sip a bit of their Cab Franc, which was also very nice. Out of our list of recommended wineries Greg picked this one because he figured that a German would know a thing or two about Rieslings. His instincts were correct and we ended up having another round of difficult choices at this small lot winery. Ultimately we took home a trio of Rieslings. Their signature Dry Riesling 2009 beautifully balances lime and grapefruit flavors with hints of apricot and flint. The 2008 Semi-dry is more fruit forward, but finishes out soft, rounded out by tropical and floras note. Finishing out our trio is the 2009 Late Harvest Riesling, which has rounded apricot and honey flavors, but has enough acidity to cut the sweetness and keep it just short of dessert wine. While we didn’t take a bottle, the 2009 Frost Cuvee was very nice for the price. In addition to having lovely wines, the people here were super nice. Our pourer, Cheryl, was delightful and one of the girl’s in the store was nice enough to run me out the car with her umbrella in the middle of a downpour. 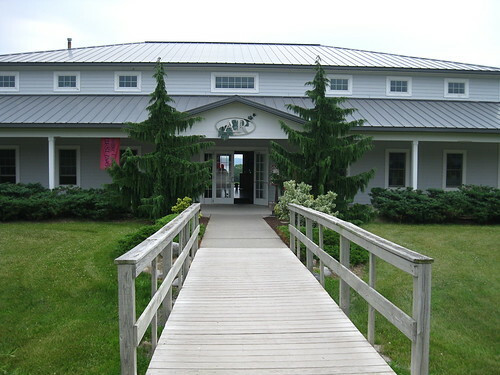 Third on our hits list was Red Tail Ridge, another boutique winery. They’re a pretty young winery with a modern feel, and apparently they’re also LEED Green certified. We showed a bit more restraint here, but not for lack of lovely options. I really enjoyed the 2009 Semi-dry Reisling, with its nectarine, citrus and kiwi flavors. However, we took home a bottle of the 2008 barrel-fermented Chardonnay, Estate Grown to satiate Greg’s desire for an oaked Chard. This one had toasty almond notes that were nicely balanced with a little fruit. The Good Karma was also very nice and 10% of profits go to Foodlink, the regional food bank. 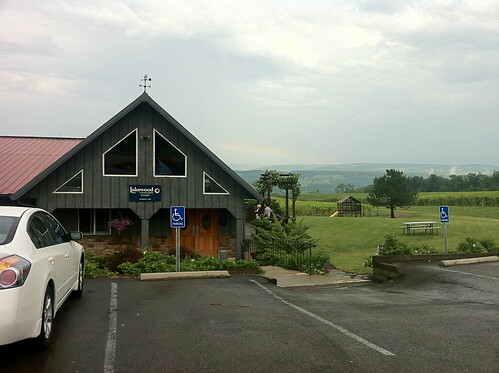 Lakewood Vineyards and White Springs struck us as having wines of a particularly good value. They both had pretty solid wines across the board at prices that were even better than the already good prices in the area. We took home three at Lakewood. The 2008 Dry Riesling made me want to find a raw seafood bar with its citrus notes and crisp minerality. We also took home the 2009 Riesling, which was nicely balanced with peach and pear flavors and just a little sweetness, and a bottle of the 2008 Long Stem White, with its crisp apple and citrus palate -- it was a very nice $7.99. The young guy that poured for us at Lakewood was also very pleasant and knowledgeable about the area and chatted with us for a good while. White Spring was the last winery we visited. We had time to kill before our friend’s brunch reception, so we figured we’d fit one more in. We were already carrying way too much wine with us back to the city, and yet by the time we left here we had a couple more bottles. We picked up the 2009 Gewurztraminer with its hints of spice and grapefruit, and the Row House White, with a hint of sweetness and peach note – another solid house white. We didn’t have as much luck at Anthony Road Winemakers and Glenora Winery. The flavors in many of the wines just tended to be off-balance for my taste. At Anthony Road I got a little too much lemon peel in several of the wines, and a little to much flint or out of place perfume/alcohol flavors in a couple at Glenora. We did take home a bottle of Tony’s Red from Anthony Road -- an uncomplicated, light, fruity red that is meant to be served chilled and seems like it would be nice for a summer BBQ. While we didn’t care for a lot of the wines at Glenora, we did have a delicious lunch there – but more on that later. I have to say, for a couple of red drinkers we did pretty well in this land of whites. 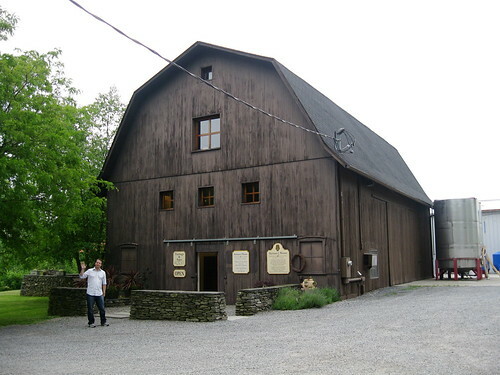 To find five wineries we liked was happily unexpected. In the end we learned that there’s a lot more to Riesling and Gewurtz than cloying sweetness, and we walked away with a quite a haul – 13 bottles in all. We had to buy a rolling cooler to get it all home.